My team and I have created tons of posters over the years, and some of my very favorite ones teach lessons that are important to showcase in the workplace. 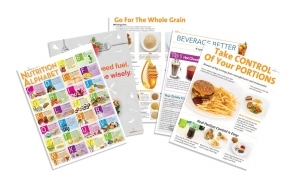 We have posters that are designed to bring “better numbers like blood pressure, cholesterol, and BMI” or to motivate in a fun way like the food art posters. 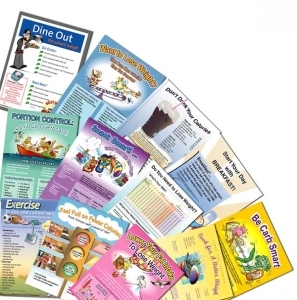 There are also ones that teach great nutrition lessons and promote positive reinforcement and education. Let’s take a tour through some of the best options, shall we? And of course there is our entire collection of over 150 posters. Which ones will best brighten up your workspace? 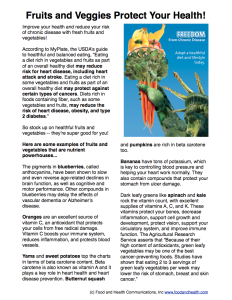 And, as a special bonus because I love ya, here’s a free copy of the printable PDF handout that accompanies the Fabulous Fruits and Vegetables poster. You know what has been flying off the shelves lately? 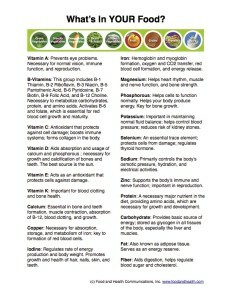 The Vitamin and Mineral Chart. 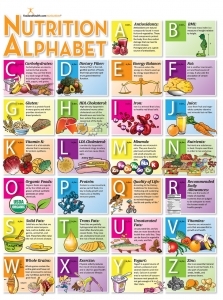 This poster highlights particular foods that are rich in certain vitamins and minerals. Since most consumers need to eat a more plant-based diet in order to avoid excess saturated fat, sodium, and added sugars while somehow managing to get enough nutrients in the calories allotted, it’s wise to have a few materials that could make that transition easier. This chart has been an eye-catching tool for inspiring and maintaining motivation, along with teaching key nutrient lessons. As a special bonus, I want to share the printable educational handout that comes with the poster. Normally you could only access this if you had already bought the poster, but today I’m going to make an exception. 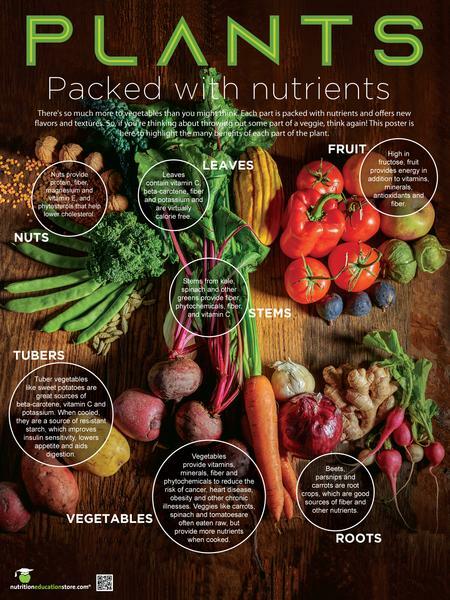 The Eat Your Nutrients handout features macronutrients and micronutrients alike, highlighting the health benefits of these vital food elements. Vitamin A: Prevents eye problems. Necessary for normal vision, immune function, and reproduction. B-Vitamins: This group includes B-1 Thiamin, B-2 Riboflavin, B-3 Niacin, B-5 Pantothenic Acid, B-6 Pyridoxine, B-7 Biotin, B-9 Folic Acid, and B-12 Choline. Necessary to metabolize carbohydrates, protein, and amino acids. Activates B-6 and folate, which is essential for red blood cell growth and maturity. Vitamin C: Antioxidant that protects against cell damage; boosts immune systems; forms collagen in the body. Vitamin D: Aids absorption and usage of calcium and phosphorous ; necessary for growth and calcification of bones and teeth. The best source is the sun. Vitamin E: Acts as an antioxidant that protects cells against damage. Vitamin K: Important for blood clotting and bone health. Calcium: Essential in bone and teeth formation, muscle contraction, absorption of B-12, blood clotting, and growth. Copper: Necessary for absorption, storage, and metabolism of iron; key to formation of red blood cells. Iodine: Regulates rate of energy production and body weight. Promotes growth and health of hair, nails, skin, and teeth. Iron: Hemoglobin and myoglobin formation, oxygen and CO2 transfer, red blood cell formation, and energy release. Magnesium: Helps heart rhythm, muscle and nerve function, and bone strength. Phosphorous: Helps cells to function normally. Helps your body produce energy. Key for bone growth. Potassium: Important in maintaining normal fluid balance; helps control blood pressure; reduces risk of kidney stones. Selenium: An essential trace element; protects cells from damage; regulates thyroid hormone. Sodium: Primarily controls the body’s osmotic pressure, hydration, and electrical activities. Zinc: Supports the body’s immune and nerve function; important in reproduction. 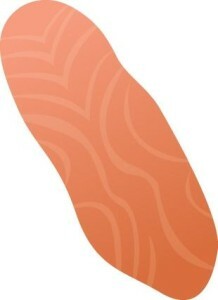 Protein: A necessary major nutrient in the diet, providing amino acids, which are necessary for growth and development. Carbohydrate: Provides basic source of energy; stored as glycogen in all tissues of the body, especially the liver and muscles. Fat: Also known as adipose tissue. Serves as an energy reserve. Fiber: Aids digestion, helps regulate blood sugar and cholesterol. And here’s a free printable copy of the handout! 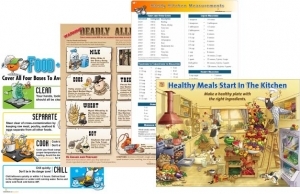 Looking for more nutrition education materials? 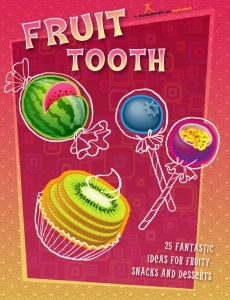 Here are some of the newest resources to hit the store! What Do You Know About Figs? I just harvested figs from our tree, and I’m feeling very lucky! Our climate is great for growing figs, so when our neighbors moved north, we adopted their tree. 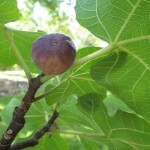 If you’re not fortunate enough to have your own fig tree, perhaps a friend can share their crop with you. Or you can always find some at a local market, though it can be a challenge to find figs at farmer’s markets, since they don’t store well and have a very short shelf life. But however you try it, get your hands on some fresh figs! 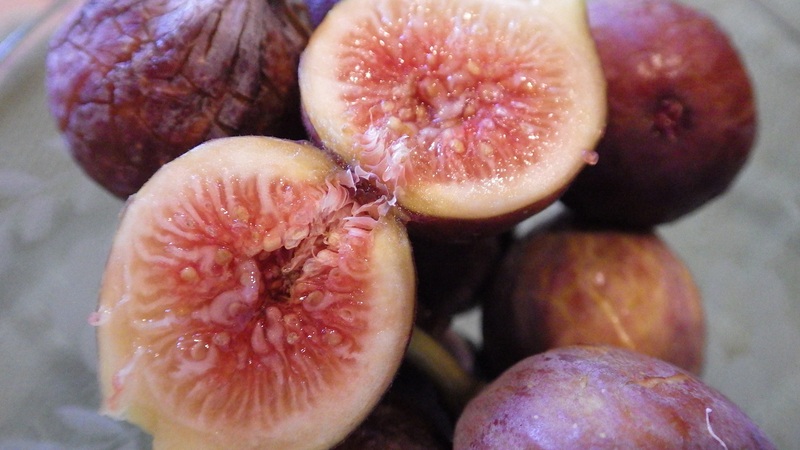 When selecting figs, pick ones that are plump, clean, and dry, with smooth, unbroken skin. They should be soft and yield to the touch, but do not choose mushy ones. Fresh figs are very perishable. They can be stored in plastic bags in the coldest part of the refrigerator, but they’ll only keep for 2-3 days after picking. 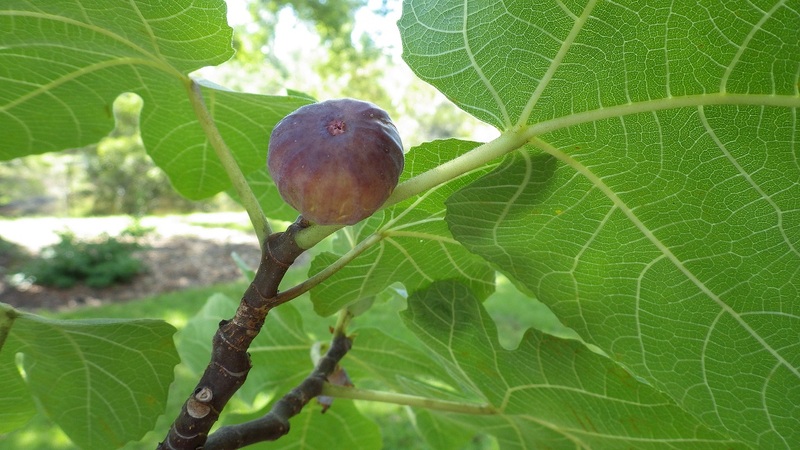 If you’re lucky enough to have an abundance of figs, they may be dried, frozen, canned, or made into jam or preserves. Many people are not familiar with fresh figs. Often their only exposure to this fruit is in the dried form or in baked goods like fig cookies. 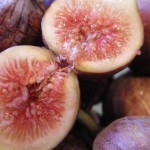 But figs can be eaten fresh, just as you would any other fruit, and they’re really a treat. Use figs as another way to add variety to meals, or try them as another interesting fruit that can help you get those desired fruit and vegetable servings each day. 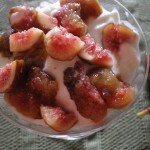 Just 3-5 dried figs (about ¼ cup) or ½ cup of fresh figs count as one fruit serving. Now let’s talk nutrition. Figs are known for their high fiber content. They also contain more calcium, more potassium, and more iron than many other common fruits. They’re also full of disease-fighting antioxidants. Fresh figs are very low in calories. About 3.5 ounces (~100 grams) or nine small figs contain only 74 calories, along with three grams of dietary fiber. On the other hand, dried figs have concentrated sugars and nutrition. 12 dried figs (the same 100 grams) contain 251 calories and 10 grams of dietary fiber. Use some caution with these dried fruits — it’s really easy to eat too many in one sitting. So, what can you do with fresh figs? In addition to fig cookies, figs can be used as appetizers, salads, main dishes, and desserts. Cut them in half and put them in a salad or grill them with chicken or fish. You can also mix them with feta cheese and balsamic vinegar for a show-stopping appetizer. I personally, like them chopped and mixed with vanilla Greek yogurt. How will you enjoy fresh figs? 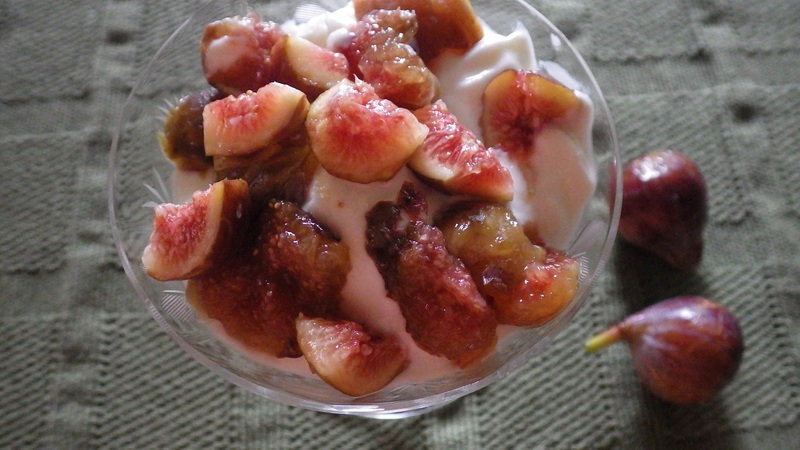 Want to offer your clients a fun way to cook with figs? 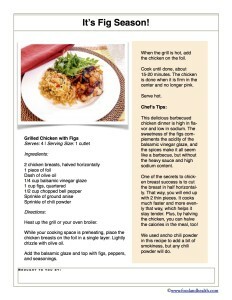 Get this free recipe handout today! 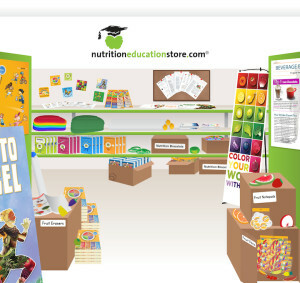 And there are lots more cooking and nutrition resources in the Nutrition Education Store! Which will make your life easier? Risk of Death for Dinner? 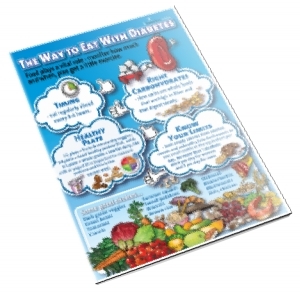 It’s time for an exclusive look at the handout that accompanies our awesome Nutrition from A to Z poster! 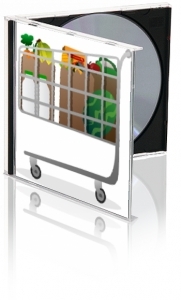 How will you use your free copy? A is for Apples. An apple a day may be a cliche, but cliches exist for a reason. You see, apples are naturally fat-free and are very low in sodium. They are also excellent sources of fiber, antioxidants, and vital nutrients like vitamin C. Try one today! B is for Balance. 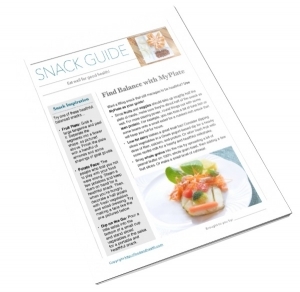 MyPlate and the Dietary Guidelines both emphasize the importance of balance in your life. Balance your calorie intake with physical activity, and balance your plate according to MyPlate’s proportion guidelines. C is for Cooking. When you cook at home, you control exactly what goes into your meals. Cook healthfully with plenty of fruits and vegetables, as well as whole grains, lean protein, and nonfat dairy. D is for Dairy. MyPlate and the Dietary Guidelines for Americans advise people to choose low- or nonfat dairy when possible. The saturated fat found in dairy products is very bad for your health, especially your heart! E is for Empty Calories. 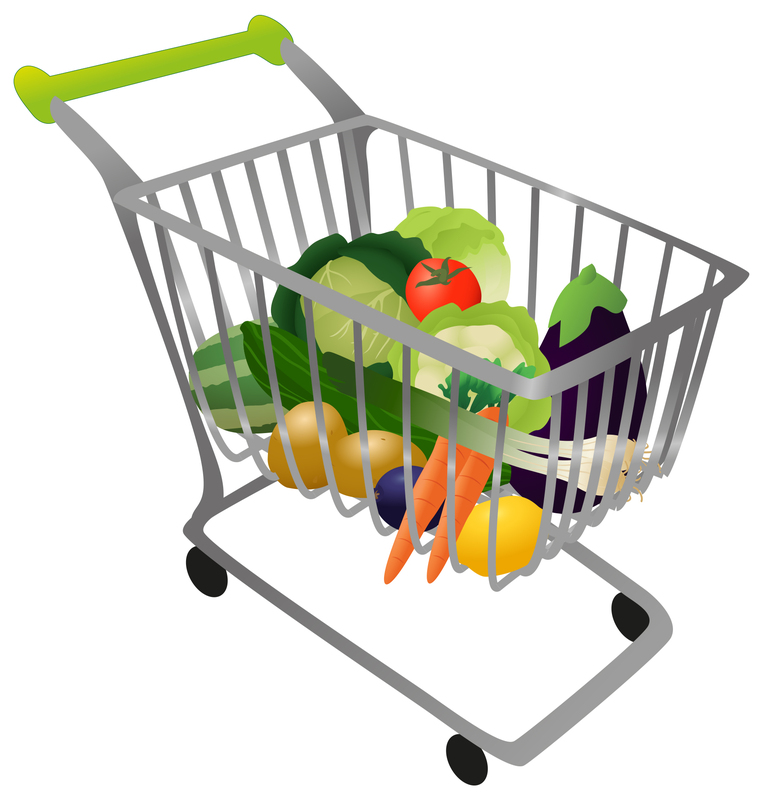 According to MyPlate, foods with empty calories are foods that contain solid fats and added sugars. They are usually calorie-dense, but these calories are very nutrient-light. Avoid foods with empty calories whenever you can — they just aren’t good for you. F is for Fruit. MyPlate’s fruit group contains everything from stone fruits to berries to tropical rarities. 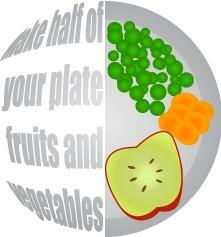 Follow MyPlate’s advice and fill half your plate with fruits and vegetables at every meal. G is for Grains. 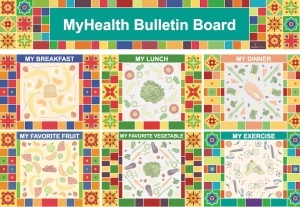 MyPlate advises people to make at least half the grains they eat whole grains, every day. In a rut? 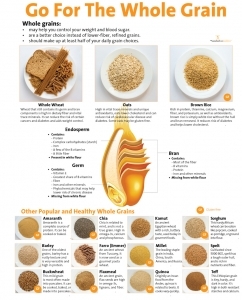 Try a new whole grain like amaranth, bulgur, or quinoa! 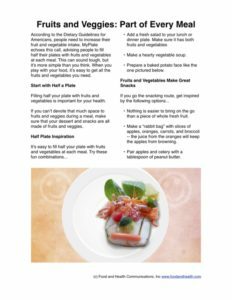 H is for Healthy Eating Patterns. The Dietary Guidelines for Americans insist that healthy eating patterns should meet nutrient needs at a reasonable calorie level. Stick to nutrient-dense foods whenever you can. I is for Include Seafood. Did you know that most people should consume at least 8 ounces of cooked seafood per week? That’s what MyPlate suggests. Just remember to keep seafood preparations lean and sidestep breaded or fried options. J is for Juice. If you do drink juice, be sure to choose options that are 100% fruit or vegetables. Juice is a hiding place for a surprising amount of added sugars. Don’t fall into the trap! Choose 100% juice instead. K is for Kids. Did you know that kids need at least 60 minutes of exercise every day? The Dietary Guidelines for Americans posts that number as the minimum for most children, so get out there and play! L is for Lean. When you go to get your servings from the protein food group, stick to lean options. 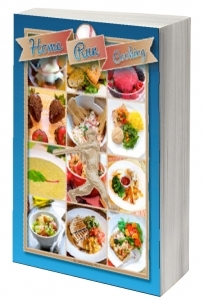 Try beans, peas, white meat poultry, or lean cuts of beef or pork. 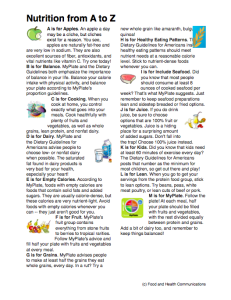 M is for MyPlate. Follow the plate! At each meal, half your plate should be filled with fruits and vegetables, with the rest divided equally between protein and grains. Add a bit of dairy too, and remember to keep things balanced! N is for Nutrients. Most Americans aren’t getting enough nutrients. According to the Dietary Guidelines for Americans, people should replace foods that are made mostly of empty calories with nutrient-dense foods. Nutrients of concern in American diets include calcium, potassium, vitamin D and dietary fiber. O is for Orange. Oranges are a nutrient powerhouse. They are full of vitamin C, antioxidants, and fiber. Eating oranges may also help lower your blood pressure and cholesterol. Try one today! P is for Protein. MyPlate’s protein group is filled with meat, nuts, poultry, seeds, seafood, eggs, beans, and peas. Eat a wide variety of lean options daily. Q is for Quality of Life. According to the Dietary Guidelines for Americans, “Achieving and sustaining appropriate body weight across the lifespan is vital to maintaining good health and quality of life” (2010, page 8). R is for Reduced Risk. 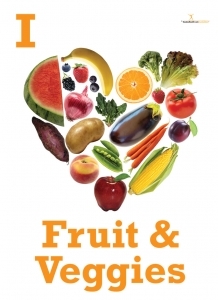 MyPlate claims that eating fruits and vegetables will reduce your risk of heart disease. That’s just one more reason to fill half your plate with fruits and veggies at each meal. S is for Sodium. Most people are consuming way too much sodium. The Dietary Guidelines for Americans advise people to keep sodium consumption below 2300 mg per day. People who are African American, are over 51, or who have hypertension, diabetes, or kidney disease should all consume less than 1500 mg of sodium per day. T is for Tomato. Tomatoes are filled with key nutrients to improve your health. They are excellent sources of vitamins A, C, and K, and also contain fiber and several B vitamins. U is for Unique. Did you know that beans and peas are unique foods? MyPlate counts them as both a vegetable and a protein, so tally them where you need them the most! V is for Variety. While portion sizes should stay small, it is important to eat a variety of fresh and healthful foods. Don’t fall into the rut of eating the same foods over and over — you could be missing out on nutrients! Look for new and nutritious foods to try each day. W is for Water. One of MyPlate’s key consumer messages is to replace sugary drinks like soda and sport beverages with water. Water is essential to health, and many people don’t drink enough of it. X is for eXplanation. 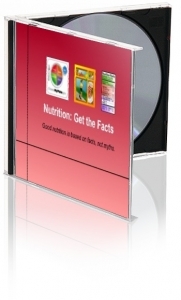 Do you want more details about healthful eating and balanced nutrition? Visit www.ChooseMyPlate.gov for more information about MyPlate. Or, drop by www.health.gov/dietaryguidelines for a closer look at the Dietary Guidelines for Americans. Y is for Yogurt. Yogurt is a great source of calcium, but make sure that it doesn’t overload you with sugar and fat. Stick to low- or nonfat options, and check sugar content to make sure it isn’t too high. Z is for Zone. Keep foods out of the danger zone. Food that has been sitting out at 40-140 degrees F for more than 2 hours is no longer safe to eat. Like what you see? Here’s the free handout! 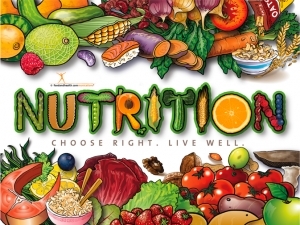 Normally you can only get this when you get the Nutrition from A to Z poster, but we’re making an exception for you today! But wait, there’s more! 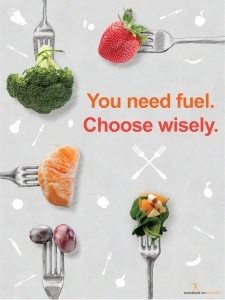 Check out these great nutrition education posters that will help you look your very best, right now! 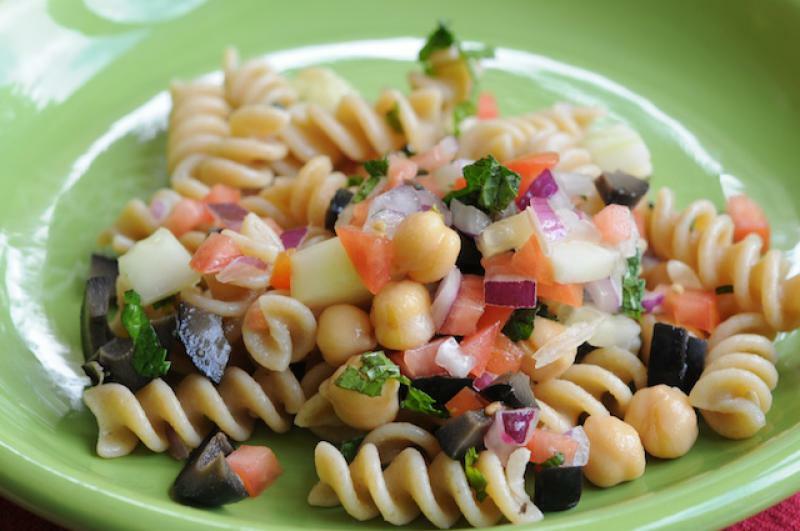 Chickpeas, Garbanzo Beans, and Cece… Oh My! I have to admit, chickpeas were one of those foods I could take or leave. 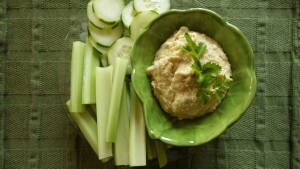 The only time I ever really ate chickpeas was when they were in three bean salad or hummus. That all changed recently, when I started looking for a way to pep up our meals at home. Now these flavor and nutrient powerhouses have become a regular feature in our meal rotation. It turns out that these hearty little legumes go by many different names. Some folks call them chickpeas, while others insist on garbanzo beans as their moniker. The Italians call them cece. Don’t worry — no matter what you call them, these beans are delicious. The most common form of chickpeas are pale yellow in color, but they can also be black, brown, green, or red. Their flavor and texture have been described as somewhere between chestnuts and walnuts. When cooked, they have a creamy consistency with a mildly nutty flavor profile. This makes them the perfect base for spiced dishes and stronger flavors. Originally from the Middle East, chickpeas are the most widely-consumed legume in the world. Did you know that? I was surprised! The largest producers of chickpeas are India, Australia, Pakistan, and Turkey, but these beans can also be grown the United States, Canada, and Mexico. Chickpeas are legumes, which means that they have seed pods in the plants, and are similar to beans or peas. 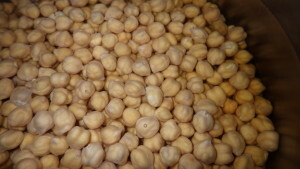 Each chickpea seedpod usually contains two to three edible peas. So, why should you make chickpeas a part of your diet? Well, for one thing, they are full of nutrients! A cup of cooked chickpeas contains 15 grams of protein, with only about 269 calories and 4 grams of fat. There is no cholesterol in chickpeas, and they are very low in sodium. They are also sources of folate, iron, phosphorus, magnesium, calcium, and zinc. Like other beans, they are a great source of dietary fiber (12 grams per serving). 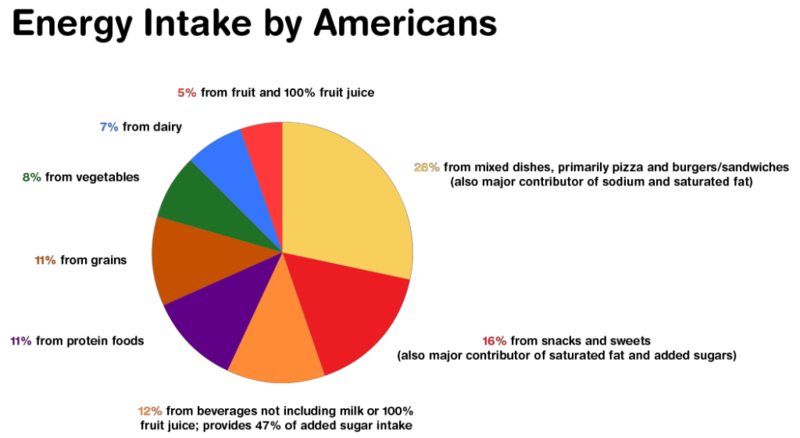 For a closer look at the nutrient profile of chickpeas, check out the post MyPlate Flavor Exploration: Beans and Peas. But how can you make chickpeas a part of your diet? Chickpeas can be purchased canned and ready-to-eat. This is convenient, but unless they are canned without salt, they are generally pretty high in sodium. Chickpeas can also be purchased as dried beans. Like other dried beans, they need to be soaked before cooking and generally have a long cooking time. 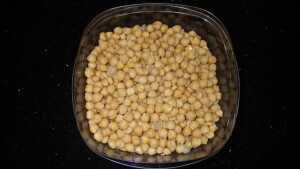 To cook dried chickpeas, drain them and rinse well to remove any foam. Set them in a big saucepan and add water in a 3:1 ratio (3 parts water for every 1 part dried chickpeas). Bring the whole shebang to a boil over high heat, then cover, reduce the heat to low, and simmer for about 1 1/2 hours, or until tender. When I made chickpeas, I soaked them overnight and then cooked them on low in the slow cooker for five hours. I ended up with perfectly cooked beans! 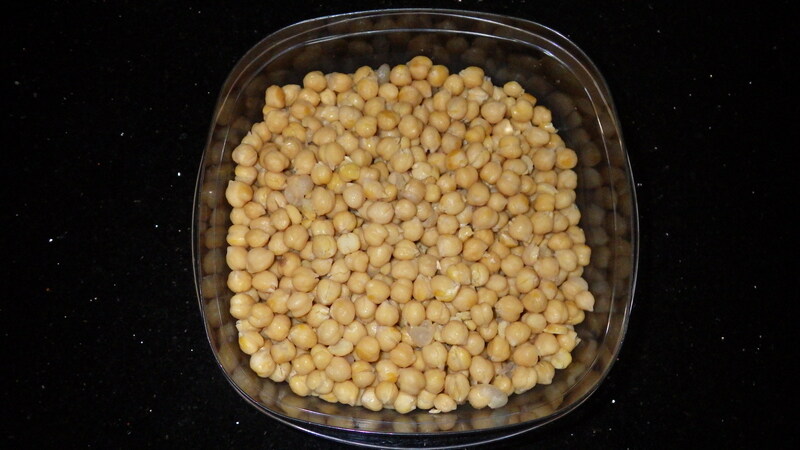 Once cooked, chickpeas can be stored, covered, in the fridge for up to a week. Since one pound of chickpeas makes about 8 cups, I had lots of beans to use. Once you are open to experimenting, chickpeas can be used as you would other beans. I put them in salads, stews, soups, casseroles or ground as hummus. Extra cooked beans can be frozen. No matter what they’re called, I’m glad I gave these little nutrition powerhouses a try. I’ll do it again! We are here when you want to look your very best right now. Is it TWO or FOUR? 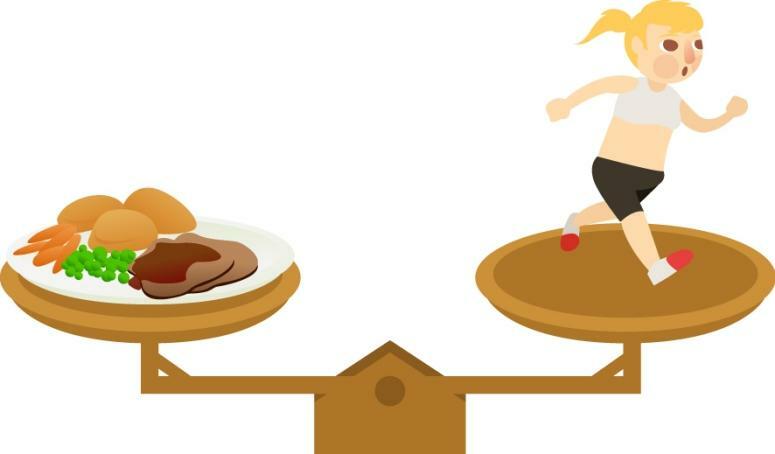 Let’s get serious about dietary guidelines. The Dietary Guidelines for Americans are published jointly every 5 years by the U.S. Departments of Health and Human Services (HHS) and Agriculture (USDA), as mandated by Congress. The goal of the Dietary Guidelines is to provide science-based nutrition and food safety recommendations for people two years and older to help promote habits that maximize good health and reduce the risk for chronic disease. Unfortunately, despite widespread efforts, eating habits overall remain largely unchanged. The majority of the population consumes too many refined grains, solid fats and added sugars, yet at the same time consumes too little fruit, vegetables, whole grains, and low-fat dairy products. I find it disturbing that vegetable intake has actually declined since 2001-2004. Many young children consume the recommended amount of fruit and dairy, but these levels drop once they reach school age. There is a continued emphasis on consuming a diet high in fruit, vegetables, whole grains, and low-fat dairy products, all of which are good sources of the nutrients that continue to be underconsumed by the majority of Americans: vitamin D, calcium, potassium, and fiber. These foods are also low in the saturated fat and sodium that are typically overconsumed by Americans. Of interest, cholesterol is no longer considered a nutrient of concern. There is strong evidence that a high sodium intake increases risk of hypertension, leading the DGAC to continue to recommend decreasing sodium intake to 2,300mg per day. There is limited evidence of the value of reducing sodium intake further, or in terms of the role of potassium in hypertension. So make of that what you will. The DGAC strongly states that people should discourage the consumption of low-fat or non-fat foods when the fat is replaced by refined carbohydrates or added sugars. The committee continues to recommend that less than 10% of a person’s overall daily calories should come from saturated fat, noting that replacing saturated fat with polyunsaturated fatty acids (PUFAs) reduces LDL-cholesterol levels and cardiovascular disease (CVD) risk. There is strong evidence that replacing saturated fat with carbohydrates does not lower CVD risk, and there is limited evidence that replacing saturated fat with monounsaturated fatty acid (MUFA) leads to reduced CVD risk. Encouraging the use of non-hydrogenated vegetable oils including soybean, corn, olive and canola oils instead of animal fats or tropical fat is recommended instead of reducing saturated fat in the diet and increasing carbohydrate intake. Instead of replacing fat with refined carbohydrates and added sugar, the recommendation is to increase nutrient-dense foods including whole grains, legumes, vegetables and fruit. It also includes increasing healthful sources of protein including legumes, nuts, low-fat dairy, and lean meats. The DGAC recommends limiting added sugars to a maximum of 10 percent of total daily caloric intake. To meet this goal, sugar-sweetened beverages, which currently provide 39% of added sugars, should be replaced with unsweetened beverages. What offers the most nutrient-dense diet? 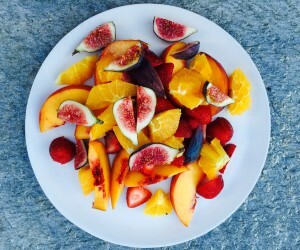 The guidelines explain that a diet that is based on vegetables, fruit, whole grains, legumes, nuts, and low-fat dairy, which includes more seafood and less red and processed meat, which is moderate in alcohol, and which contains low amounts of refined grains and sweetened foods and beverages provides the most nutrient-dense diet. The DGAC notes that there are several different diet patterns that follow these guidelines, including the Healthy U.S.-Style Pattern, the Healthy Vegetarian Pattern, and the Healthy Mediterranean-style Pattern. Each of these patterns provides more plant-based foods and lower amounts of meat than are currently consumed by the US population. The committee notes that overconsumption of nutrients from foods and beverages, including fortified foods is rare. However, folate, calcium, iron, and vitamin D may be overconsumed when using high-dose supplements. 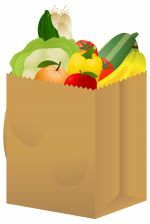 The committee found that the majority of the population consumes three meals plus at least one snack, with adolescent females, young adult males, non-Hispanic Blacks, Hispanics, and individuals with lower incomes being the least likely to consume three meals a day. While breakfast tends to have a higher overall dietary quality compared to other meals and snacks, adolescents and young adults are the least likely to eat breakfast. Snacks contribute about 25% of daily energy intake, and unfortunately tend to be lower in important nutrients and higher in sodium, added sugars, and saturated fat. It’s surprising that the USDA food patterns do not meet recommendations for potassium and vitamin D, and additional fortification strategies may be necessary to reach the RDA for vitamin D.
It’s well-known that rates of chronic disease are linked to overweight and obesity, playing a role in hypertension, CVD, type 2 diabetes, and some types of cancer, and that these weight-related illnesses now are present in children and adolescents who are overweight or obese. It’s not surprising that 90% of children with type 2 diabetes are overweight or obese. Reducing screen time, especially for children and adolescents to promote a healthy body weight as they transition into adulthood. 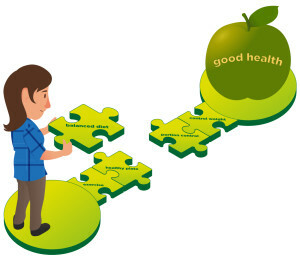 The food environment is an area that requires more research to establish the most effective strategies to improve nutrition and health in schools and workplaces and to presents opportunities for RDs to collaborate with other groups to effect change. The DGAC found strong to moderate evidence that multicomponent school and worksite policies are associated with improved dietary intake, including increased vegetable and fruit consumption and reduced body weight. Polices that include increased opportunities for physical activity, nutrition education, food service changes, and in schools (and parental involvement) are the most effective. Both farmed and wild-caught seafood are nutrient-dense foods that are rich sources of healthy fatty acids. The risk of contamination is similar between farmed and wild caught seafood and does not outweigh the health benefits of consuming seafood. Wild-caught seafood cannot meet the growing demand, creating a need for sustainable seafood farming practices. The research shows that in general, caffeine intake does not exceed recommend levels. Moderate coffee consumption is considered to be 3-5 cups per day, or up to 400mg of caffeine per day. Moderate coffee consumption does not lead to increased health risk, and in fact is associated with decreased risk of type 2 diabetes, cardiovascular disease, liver and endometrial cancer, and Parkinson’s disease. The DGAC agrees with the American Academy of Pediatrics and the American Medical Association that until safety has been demonstrated, vulnerable populations including children, adolescents and young adults should avoid high-caffeine energy drinks or other products with high amounts of caffeine. 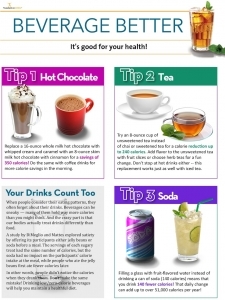 Alcohol and energy drinks should never be mixed or consumed together. Women who are pregnant or planning to become pregnant should be cautious and adhere to current recommendations of the American Congress of Obstetricians and Gynecologists and consume less than 200 mg caffeine per day (approximately two cups of coffee) to reduce risk of stillbirth, miscarriage, low birth weight, and small for gestational age. Aspartame is the football of sugar substitutes, going back and forth from being banned to considered a safe option. The DGAC concurs with the European Food Safety Authority (EFSA) Panel on Food Additives that aspartame in amounts commonly consumed is safe and poses minimal health risk for healthy individuals without phenylketonuria (PKU). The risk to pregnant woman is unknown. However, long-term human studies are needed to assess a possible relationship between aspartame and risk of non-Hodgkin lymphoma and multiple myeloma. The recommendation is to stay below the aspartame Acceptable Daily Intake (ADI) of <50mg/kg/day. A 12-ounce diet beverage contains approximately 180mg aspartame. A 150-pound (68 kg) woman could drink up to 18 12-ounce diet beverages sweetened with aspartame and meet this guideline. Anyway, that’s a collection of my immediate thoughts about the highlights from the latest DGAC update. What stood out to you? What most affects your practice? But wait, there’s more! Be sure to check out these amazing new products! 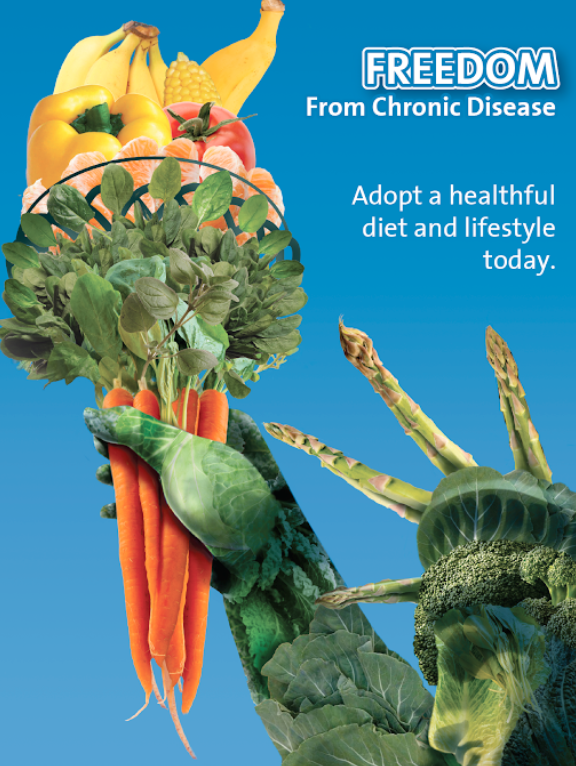 Improve your health and reduce your risk of chronic disease with fresh fruits and vegetables! So stock up on healthful fruits and vegetables — they’re super good for you! The pigments in blueberries, called anthocyanins, have been shown to slow and even reverse age-related declines in brain function, as well as cognitive and motor performance. Other compounds in blueberries may delay the effects of vascular dementia or Alzheimer’s disease. Oranges are an excellent source of vitamin C, an antioxidant that protects your cells from free radical damage. Vitamin C boosts your immune system, reduces inflammation, and protects blood vessels. Yams and sweet potatoes top the charts in terms of beta carotene content. Beta carotene is also known as vitamin A and it plays a key role in heart health and heart disease prevention. Butternut squash and pumpkins are rich in beta carotene too. Bananas have tons of potassium, which is key to controlling blood pressure and helping your heart work normally. They also contain compounds that protect your stomach from ulcer damage. Like what you see? Here’s the handout! 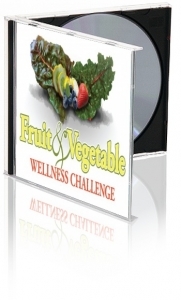 There are tons of other ways to promote fruits and vegetables! Check out some of the bestselling resources today! Hooray for fruits and vegetables! Everyone loves the “I heart” message, and now it’s coming to a wellness poster for you! 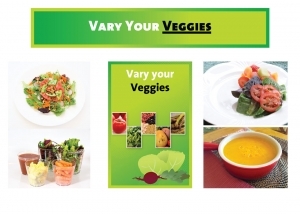 This eye-catching nutrition poster will help remind your clients to eat more fruits and vegetables each day. We combine color, a simple visual message, beautiful food photos, a heart icon, and a fresh look at health in this poster. 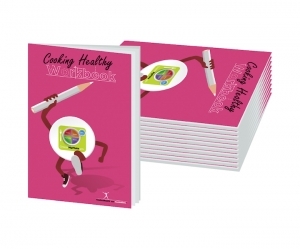 It can serve as a wellness poster, motivational poster, fruit and vegetable promotion poster, school poster, or a food art poster. Which role would you like it to play? So why use a health poster? The possibilities are endless! You can pep up any space, communicate key health messages in a fresh new way, and even introduce people to fruits and vegetables that they haven’t tried before. “The materials and poster I ordered were great.” — Michelle McCracken-Brown, PA-C, Physician Assistant, Health Center Manager, Take Care Health Systems, Inc. So what are you waiting for? Get your copy of the I Heart Fruits and Veggies Poster today! Or preview this free handout that accompanies the poster! We were delighted to get a product request from Sharon Baird, RD, MEd, MBA, Food Service Director for the Goleta Union School District. Sharon was troubled by the school salad bars, which looked woefully plain. We immediately set to work creating a giant salad bar tabletop sign, called eat from the rainbow, that promotes healthful eating. It took a while to pick out and arrange the perfect fruits and vegetables, but we did it! Now we couldn’t be more pleased with the result. The sign was a hit at the school district as well. In fact, it was such a hit that we crafted a matching banner and poster too. 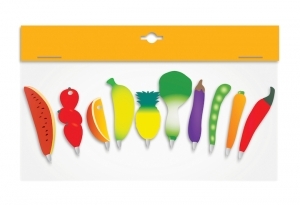 That way, the rainbow of health could be displayed above or below any serving table. 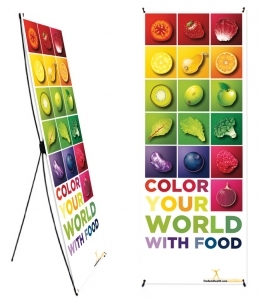 The eat from the rainbow oster lends itself especially well to displays in employee break rooms and the offices of RDNs. What a bonus! 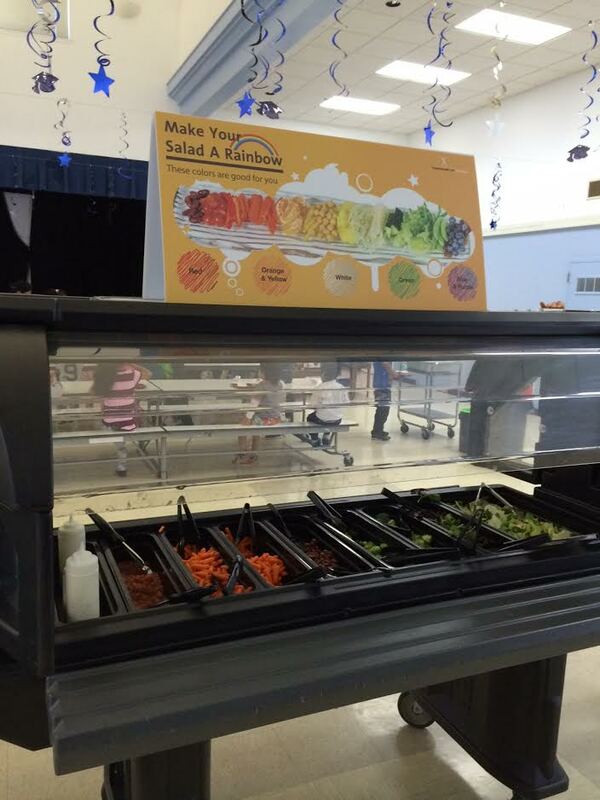 Here’s a picture of the salad bar sign as it’s being used in the school district that had asked for it in the first place. Don’t you love the pop of color and encouraging message? The photo of the rainbow salad is actually almost three feet long. It is digitally stitched from six high resolution photos of a real salad that was 3 feet long. Sharon wanted a salad bar sign that could safely sit on top of the salad bar, and since the salad bar needed to be moved daily, the sign had to be easily portable as well. We managed it, and the sign has been working perfectly. After all, the finished table topper’s design is very practical. It assembles easily, and its lightweight construction makes it great to transport anywhere, anytime. So, what’s so awesome about eating from the rainbow? Basically, eating a variety of fruits and vegetables will get you a wider range of nutrients than eating the same few fruits or veggies every week. Colorful fruits and vegetables are also wonderful sources of substances called phytochemicals. Lycopene (found in foods like tomatoes and watermelon). Lutein (found in leafy greens like spinach, kale, and romaine). Lutein may help prevent cancer, heart disease, and macular degeneration. Quercetin (found in onions, kale, broccoli, red grapes, cherries, apples, and red wine). Quercetin may help prevent cancer, heart disease, and seasonal allergies. Resveratrol (found in red grapes, red wine, and peanuts). Resveratrol may help prevent cancer and heart disease. So what are you waiting for? Order your very own tabletop sign today! Do You Have to Drink Green to Eat Clean?